The Spoetzl brewery was founded in 1909 in the town of Shiner, Texas by German immigrants looking to recreate the beers they were used to at home. The brewery is named after the second brewmaster and long time owner Kosmos Spoetzl. Today, Shiner brews up a healthy portfolio (reviews of all Shiner beers to follow) with Shiner Bock as the flagship product. We learned about the Bock style a few posts back in the review of Saint Arnold Spring Bock. We also learned that there is some contention as to what classification this beer even belongs to. But while this may in reality be an American Dark Lager, for now we’ll go with the brewer and call it a Bock. Full disclosure: I drink a lot of this beer. Living in the Houston area, Shiner Bock is my faithful stand-by. I don’t always have the luxury of buying my beer from a specialty shop, or even high-end grocer. In fact, I end up having to buy a lot of beer from *gasp* gas stations. This is where Shiner (people mostly refer to Shiner Bock as simply “Shiner”) comes in. In an endless sea of macro lights, Shiner is the only decent beer to be found in many grocery stores, gas stations and skeezy bars in the area. Funnily enough, at many restaurants in the area, it’s even featured on the “import” list. Oh, Texas. Verdict: This is certainly not the greatest beer in the world, nor the greatest Bock. Hell, as we saw in that Saint Arnold Spring Bock review, it might not even be a Bock. But still, I have a very warm place in my heart for Shiner Bock. It rescues me time and time again out in here the outback of American beer culture. Just last weekend, I was attending a wedding, dreading choosing between choosing either tea or Bud Light after Bud Light. Then, out of nowhere my spirits lift when I hear the golden words: “They have a keg of Shiner.” I’m proud to say at my upcoming wedding, we will be having a keg of Shiner, too. Though, to be fair I’ll also have a secret stash of some higher-end beers. I guess that’s about the most perfect metaphor for this beer I could have come up with. I’m sure you have your own regional beers, that while not exactly world-class, seem to keep ending up in your hand weekend after weekend. Leave a comment and let me know. Pretty much sums up Shiner Bock. 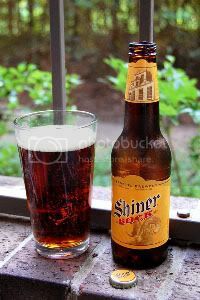 Shiner Bock is the steak you make at home, other "good" beers are what you order at a good steak house. I like that analogy a lot. Shiner Bock puts Mich amber bock to shame. Unfortunately, I was fully unimpressed with this beer. I had recently read about bock style beers online and wanted to try one so I picked up a sixer of this little guy. I was immediately disappointed that it was a twist off (usually not a good sign) and once in the glass it was a shade better than the BMC I had had in college. Sorry to put one of your favorites down, but I didn't like it. However, I am very glad that you do. That is the great thing about beer, there are so many styles and brands that everyone can find one they like. And because they like it it doesn't make it a good or bad beer, it just makes it a good or bad beer to them. Thanks again for all the great reviews. Keep them coming. I have to think that the taste buds for some people just act differently than for others. For example, I can't stand the taste of lettuce even if it just barely touched my burger and was quickly removed. Not matter how much ketchup or mustard, can I disguise the fact that it has that lettuce taste. My daughter o the other hand says that lettuce is tasteless. I suspect that the same can be said for beer drinkers. Either we are used to a particular flavor and consider it the norm and don't like anything else or we are able to appreciate the flavors in a really good beer. Compared to most mass market domestic brands, Shiner is a pretty good beer. It beats the 'ell out of anything produced by Bud, Miller, Coors, etc. And of course the main reason to drink it instead of the National Beer of Texas is that it's not quite as embarrassing to be caught drinking it (vs Lone Star) while still being drinking a beer that does not enrich some foreign locale (e.g. Milwaukee). Colin, I have the same exact thing with lettuce, but only iceberg. How strange!